Spooks & goblins scream with delight as we decorate 6 hauntingly good cupcakes. Make cupcakes so wickedly amazing that you won’t want to eat them! Just bring your favorite apron and get ready to learn and have fun. •Tuition: $45 includes all supplies and 6 cupcakes to take home. • Work alone or together with your little one (ages 6-13) at no extra cost! • Limit 1 child per adult please. Class limited to 8 individuals/groups. $25 non refundable deposit reserves your spot. Class spaces are first come first serve and a space may not be reserved unless payment had been made. Payments will be accepted in person or over the phone during business hours or via Pay Pal. Please contact me first if you’d like to pay via Pay Pal. There will be a $3 fee for Credit Card Payments. Balance may be paid day of class or beforehand in person, over the phone or via PayPal. ***In case of cancellation, deposit may go to another class with at least 1 weeks notice from class date. If canceled within the week, deposit CANNOT be transferred and no refund will be given. Please message us on Facebook or call for more information. 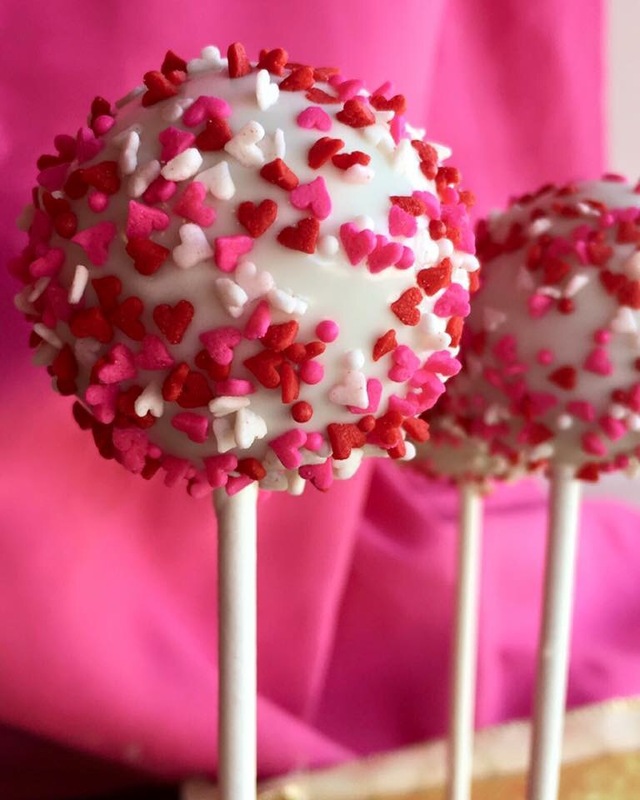 Learn the basics of working with chocolate and preparing cake pop dough as well as rolling, forming, dipping and decorating Valentine’s Day themed cake pops! Just bring your favorite apron and get ready to learn and have fun. •Tuition: $45 includes all supplies and 6 cake pops to take home. • Work alone or together with your little one (ages 5-13) at no extra cost! Call us at 956-618-3548 for more information. Get ready to create some delicious holiday cheer! We’ll teach you how to create a beautiful wreath complete with buttercream poinsettias using our delicious cupcakes. Class runs about 3 hours, where you will learn the fundamentals of setting up & frosting a cupcake cake, as well as piping buttercream holiday flowers and leaves. Included in each workshop class are all ingredients, and tools. Tuition: $40 each person. Parent or Supervising adult may work with child 12 & under for $10 more. All tools and supplies will be shared. Limit one child per adult. Class is open to all skill levels. $20 non refundable deposit required to book your spot.